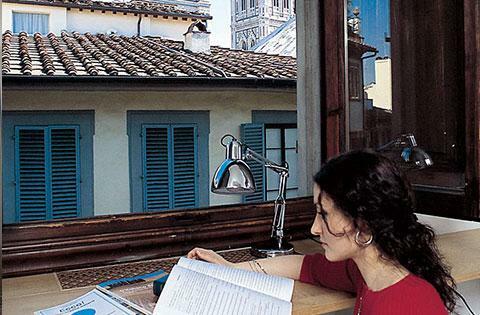 Our Italian language school in Florence offers various accommodation services. Shared apartments and shared rooms - This option is recommended for people up to 30 years old, as it requires flexibility and a spirit of adaptability. This accommodation is basic, and students are in charge of cleanings and taking care of the house themselves. In our experience, mature students have more difficulty in sharing a flat with younger students who have different habits and pace of life. We can also offer you the possibility to share a double room with a friend, even if your friend is not going to be studying at our school. Deposit for shared apartments - A deposit of € 100 must be paid at the school's housing office, in cash, on the first day of school. The deposit will be returned upon departure, any costs of necessary repairs and / or cleaning will be deducted from this amount. Wifi - Most of our accommodations have wifi, but this is an optional service. If Wifi is available in the accommodation, € 5 per week will be automatically detracted from the deposit. Availability - The accommodation is available from 2 pm on the Sunday before the course starts until 10am on the Saturday after the end of the student’s course. Earlier (before 2 pm) or later (after 10 pm) arrivals should be communicated well in advance. After 10 pm a "late arrival fee" of € 25 will be applied. If you arrive a day earlier or you need to stay a day longer, please let us know and we will help you find the best solution to suit you. If you think you will need to change the arrival or departure day, you must communicate this in writing to us. It is not possible in any case to arrive before the Saturday before the course starts or stay longer than the Sunday after the end of your course. Address and arrival – The address and the price of the accommodation will be sent to you about ten days before the course starts. Since school is closed on weekends, you will have to go directly to the provided address. You should let the school know your arrival time in Florence 3 days before arrival at the latest, so that we can coordinate your arrival and key collection with the other students staying there. Full payment must be made in Florence in the first three days of the course. If you need a transfer service from the airport to the accommodation, we can book this on your behalf, if we receive all the necessary flight information and arrival time well in advance. Without this informations, no transfer service is guaranteed. Location / keys - Our accommodations are located mostly in the city centre. However, you can easily get to school using public transport, if necessary. From most areas to the historical city centre by public transport, it will take between 15 to 25 minutes. If your accommodation is located in the city centre, it will take approximately 10 minutes on foot to reach the school. Reservations and payments - To book accommodation, we need your credit card number as a guarantee. Payment, however, must be made in full in cash. For long term stays (more than 5 weeks), monthly installments are possible. Sheets / towels / laundry - Bed-linens are provided and changed every two weeks or, in alternative, upon arrival each student will be given a set of bedlinens, two sets if they stay for a longer period. In this case students will wash bed-linens themselves. However towels are not provided. Hand washing of clothes is permitted at no extra charge. There are no washing machines on site, but there are plenty of laundromats in town. Parking - Free parking is not allowed in the whole city of Florence. Garages and public parking can be easily found in the city centre or outlying areas and you can also rent a space by the week or month, which costs less. Ask the owner of your apartment which is the closest garage or public car park to where you are staying. Photocopy of your passport - We will need a copy of your ID or passport in order to ensure your stay. This copy should be brought to the housing office (or to the landlord) on the first day of school, together with the deposit.